Does Granny Need a Shove? Wouldn’t it be the ultimate if you could infuse cannabis into your weed-reluctant grandmother’s, great uncle’s or older parents’ next meal, and then learn that their everyday aches and pains had disappeared? Baby Boomers make up the fastest growing demographic of cannabis users, according to a report by the Society for the Study of Addiction. A new wave of legal cannabis has made the herb more accessible, giving older Americans access to edibles, tinctures and topicals to manage arthritis, insomnia and a host of other common aging-related ailments and illnesses. Because the federal government classifies cannabis as a Schedule I drug, the same category as heroin, fear and stigma surrounding cannabis prevail for the older set. 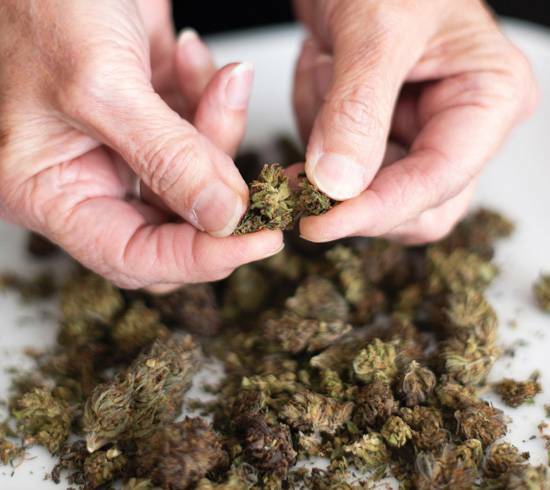 Government-backed research remains largely unfunded, and those in retirement communities, assisted living facilities and nursing homes who receive funding through Medicare and Medicaid will, for the most part, not be allowed to use weed—even in states where it’s legal. The hurdles are less prevalent where cannabis has been recreationally legal longer, such as Washington and Oregon. At the beginning of 2017, at least 12 assisted living facilities in Washington had established medical cannabis policies, according to the Washington Health Care Association. The Anderson Community in Seattle, a senior living complex that offers independent living care for Alzheimer’s patients, allows medical edibles. They don’t have a dispensary on site, but with plenty nearby, access is easy. Only residents with a prescription are allowed edibles and must keep them locked in their rooms, says community relations director Karen Roehl. But for patients whose doctor has ordered cannabis, the staff monitors them and it’s a part of their care plans. Laguna Woods Village, an assisted living facility in Orange County, California, has a collective for the residents called Laguna Woods For Medical Cannabis that provides education about the plant and information on medicating responsibly. “I know of at least six people who haven’t refilled their opioid (prescription) or they’ve been able to reduce pain, depression and other ailments they have prescriptions for by using cannabis and edibles,” says Sheri Horne, a resident who, along with her husband, uses high CBD and 3:1 THC to CBD tinctures daily to manage arthritis pain, increase appetite, lower anxiety, and get better sleep. With the dearth in research, lack of formal education and training to dispense cannabis and the plant’s federal standing, it makes sense doctors don’t recommend it. Though not all doctors are closed-off to cannabis, it takes convincing. Ronnie Bennett, a Portland, Oregon, resident, had problems sleeping after a four-month recovery from a pancreatic cancer-related operation. Over-the-counter medications and prescriptions did not help. Eventually, Bennett’s doctor told her to try cannabis. Dr. Ran Abuhasira, a researcher from Be’er-Sheva, Israel, conducted a study in March 2018 investigating cannabis use among seniors. The report found that the therapeutic use of cannabis is safe and effective. Despite these findings he remains cautious. Experts recommend researching local dispensaries and checking out the ones with the highest reviews. A medical card is not required in fully legalized states but allows for purchasing higher dosed cannabis, which is often needed for more severe conditions. Once you have it, establish a rapport with a budtender (weed expert) and openly discuss your needs (see sidebar, above). Although cannabis works for many people, it’s not for everyone. Advocates and skeptics agree that more research is needed to determine why. Diagnosed with fibromyalgia, used Lyrica for two years but side effects caused weight gain. Tried cannabis, lost 30 pounds. Grows her own cannabis and makes an infused peanut butter that provides complete pain relief for several hours. Also uses a full extraction concentrate oil blended with honey, which she mixes in water. Used morphine and Oxycodone to ease the pain from a degenerative hip disease. He tapered off those drugs after a hip replacement by using medical-grade edibles, such as gummies but also vapes. Weed also alleviates leg and foot pain that recently appeared. Cannabis eases anxiety, insomnia, chronic pain and post-traumatic stress disorder. Eats an infused chocolate blueberry and takes a dropper of a tincture at bedtime. Visit legal dispensaries and find one that feels the most comfortable. Don’t be shy about asking questions. Staff at a well-rounded dispensary will be patient, knowledgeable and welcoming. They should know all the products in the store and why people use them. Ask about the dispensary’s experience with older Americans and their knowledge of ailments that specifically affect their age group. Be open with family and friends about your interest and experiences with cannabis. will give you the desired relief or overall effect, don’t use it.